To 31 December 2016 the world population was 7.352.289.000 with an increase of 103.348.000 units compared with the previous year. Population growth was registered on every continent, including Europe: increases were registered above all in Asia (+ 49.767.000) and Africa (+ 42.898.000), followed by America (+ 8.519.000), Europe (+ 1.307.000) and Oceania (+ 857.000). 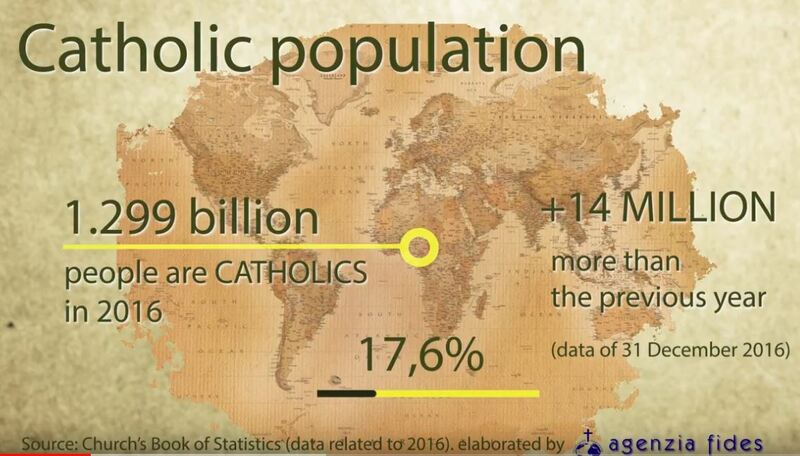 On the same date Catholics in the world numbered 1.299.059.000 units with an overall increase of 14.249.000. The increase affects all continents, except Europe for the third consecutive year (- 240.000). Increases were registered above all in Africa (+6.265.000) and in America (+ 6.023.000) followed by Asia (+ 1.956.000) and Oceania (+ 254.000). The world percentage of Catholics decreased by 0.05 %, settling at 17.67%. By continent: increases were registered in America (+ 0.06), Asia (+ 0,01) and Oceania (+ 0.02), decrease in Africa (- 0.18) and Europe (- 0,11). This year the number of persons per priest in the world increased by 254 units, average 14,336. The distribution by continent: increase in Africa (+ 271), America (+ 108), Europe (+ 66) and Oceania (+ 181). The only decrease in Asia (- 264). The number of Catholics per priest in the world increased by 39 units, average 3.130. There are increases in Africa (+ 7), America (+ 74); Europe (+ 22), Oceania (+ 52). Asia unvaried (-13). 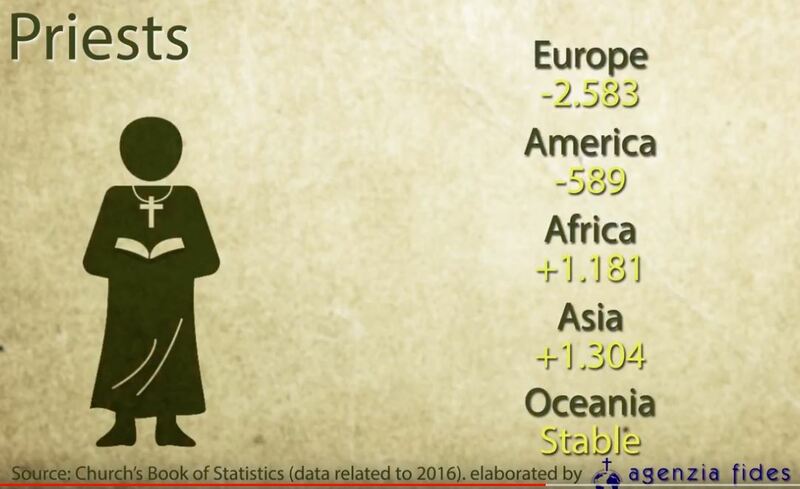 The number of ecclesiastical circumscriptions are 10 more than the previous year to 3,016 with new circumscriptions created in Africa (+3), America (+3), Asia (+3), Europe (+1). Oceania unvaried. Mission stations with a resident priest number 2,140 (581 more than in the previous year). Decrease was registered only in Africa (- 63), while and an increase was registered in America (+ 98), Asia (+ 151) Europe (+ 364) and Oceania (+ 31). Mission Stations without a resident priest decreased in number by 513 units, to 142.487. Increase were registered in Africa (+ 135), Europe (+ 456), and Oceania (+ 91). The number dropped in America (- 35) and Asia (- 1.160). The total number of Bishops in the world increased by 49 units, to 5,353. Diocesan Bishops and Religious Bishops increased in numbers. Diocesan Bishops number 4,063 (27 more), while Religious Bishops number 1,263 (22 more). The increase in diocesan Bishops is registered in America (+ 20); Asia (+ 9), Europe (+ 3), while a decrease was registered in Africa (- 2) and Oceania (- 3). The number of religious Bishops increased in all continents except Asia (- 7): Africa (+ 5), America (+ 14), Europe (+ 8), Oceania (+ 2). Permanent deacons in the world increased by 1.057 units to 46.312. The highest increase was registered again in America (+842) followed by Europe (+145), Oceania (+45), Africa (+22) and Asia (+3). Permanent Diocesan deacons in the world are 45.609, with an overall increase of 982 units. They increased on every continent except in Asia (- 38): Africa (+ 36), America (+ 807), Europe (+130) and Oceania (+ 47). Religious permanent deacons number 703, increased by 75 units compared to the previous year, with decreases in Africa (- 14) and Oceania (- 2), increases in Asia (+41), America (+35) and Europe (+15). The number of non-religious priests decreased for the fourth consecutive year by 1.604 units to 52.625. Situation: a decrease was registered in all continents: in Africa (-50), America (-503), Asia (-373), Europe (-614) and Oceania (-64). Even this year there is an overall decrease in the number of women religious by 10.885 units to 659.445. An increase was registered in Africa (+ 943) and Asia (+ 533), decrease in America (- 3.775), Europe (-8.370) and Oceania (-216). Members of male secular institutes number 618 with a decrease of (-79) after an increase compared to the previous year. At a continental level there is an increase in Africa (+2) and Asia (+ 4), while a decrease in America (- 77), and Europe (-8), Oceania unvaried also this year. The members of female secular institutes decreased this year, by 459 units to a total of 22.400 members. Increase only in Africa (+ 113), while a decrease was registered in America (-33), Asia (-35) Europe (- 502) and Oceania (-2). The number of lay missionaries in the world is 354.743 units, with an overall increase of 2.946 units in particular in America (+ 4.728) and Africa (+759). Decrease was registered in Asia (- 1.569), Europe (-921) and Oceania (- 55). Catechists in the world decreased by 36.364 units to a total of 3.086.289. An increase was registered in only in Africa (+ 10.669). A decrease was registered in America (- 20.407), Asia (- 12.896), Europe (- 13.417) and Oceania (- 313). The number of major seminarians, diocesan and religious decreased this year, they are globally 683 units, reaching a total of 116.160. Increases occured in Africa (+1.455) and in Asia (+9), while even this year a decrease in America (-1.123), Europe (-964) and Oceania (-60). Major diocesan seminarians number 71.117 (+999 more than the previous year) and Religious major seminarians 45.043 (-1.682). Diocesan seminarians increased in Africa (+1.059), America (+16) and Asia (+310). Decreases are in Europe (-381) and Oceania (-5). Religious Seminarians increased only in Africa (+396), while decreased in America (-1.139), Asia (-301), Europe (-583) and Oceania (-55). The number of minor seminarians, diocesan and religious this year decreased by 2.735 units to 101.616. Overall decrease on all continents: Africa (-69), America (-1.299), Asia (-871), Europe (-581), Oceania (-5). Minor diocesan seminarians number 78.369 (-1.729) and religious seminarians number 23.247 (-1.006). The number of diocesan minor seminarians increased in Africa (+ 236) and Oceania (+7). 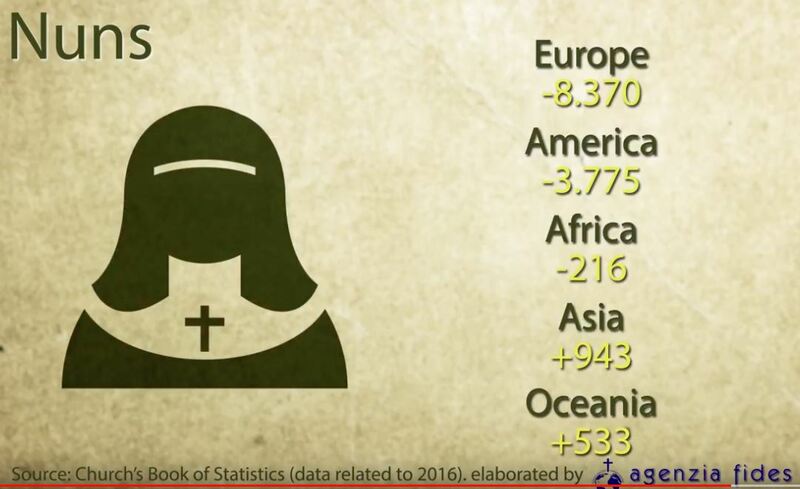 Decrease in America (-684), Asia (-988), Europe (-300), Religious minor seminarians increased in number only in Asia (+207), while decreases in Africa (-305), America (-615), Europe (-281) and Oceania (-12). In the field of education, the Catholic Church runs 72.826 kindergartens with 7.313.370 pupils; 96.573 primary schools with 35.125.124 pupils; 47.862 secondary schools with 19.956.347 pupils. The Church also cares for 2.509.457 high school pupils, and 3.049.548 university students. Charity and healthcare centres run in the world by the Church include: 5.287 hospitals, most of them in America (1.530) and Africa (1.321); 15.937 dispensaries, mainly in Africa (5.177); America (4.430) and Asia (3.300); 610 Care Homes for people with Leprosy, mainly in Asia (352) and Africa (192); 15.722 Homes for the elderly, or the chronically ill or people with a disability, mainly in Europe (8.127) and America (3.763); 9.552 orphanages, mainly in Asia (3.660); 11.758 creches, mainly in Asia (3.295) and America (3.191); 13.897 marriage counselling centres, mainly in Europe (5.664) and America (4.984); 3.506 social rehabilitation centres and 35.746 other kinds of institutions. 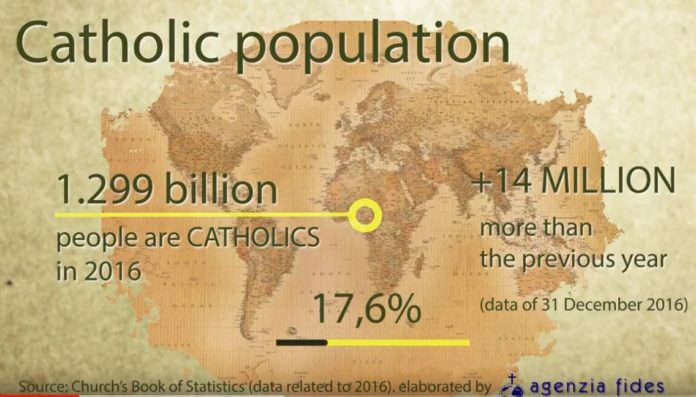 The ecclesiastical Circumscriptions dependent on the Congregation for the Evangelization of Peoples (Cep) are 1.114 with an increase of 3 circumscriptions compared to last year. Most of the ecclesiastical circumscriptions are mainly in Africa (511) and in Asia (482), followed by America (75) and Oceania (46).